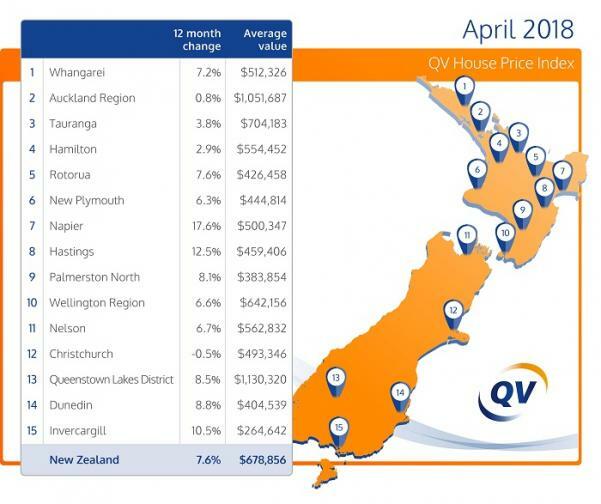 The latest data in from QV (utilising data by CoreLogic), national property values showed very little growth of 0.2% in April 2018. Property value growth remains constrained with five of the six main centres seeing a minor loss in average value through the month of April 2018. The inconsistent and constrained growth across the main centres is obvious in Auckland (0.8%) where, aside from minor monthly fluctuations values have been flat for about 18 months now. The New Zealand property market is currently showing a prolonged period of soft conditions as stricter mortgage serviceability criteria continues to limit the ability of potential buyers to borrow. With the extension of the bright line test to five years, as well as the Healthy Homes Guarantees Act changes coming into effect later this year, some investors will be questioning the profitability of adding to their property portfolio. Also, while mortgage interest rates have been dropping again recently, lenders are cautious and limiting interest only loans and testing serviceability at over 7%. What this means is there hasn't been an increase of newly-eligible buyers despite the minor relaxation of the LVR limits from 1 January 2018. Although KiwiBuild homes are now under construction, there is a long way to go before housing supply meets demand, especially considering the high rate if net migration.. A high rate of population growth will help to support housing demand and ensure the slow-down remains a relatively conservative one.